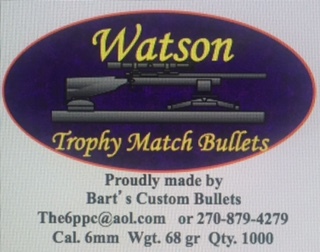 The Watson Flatbase is a 8 ogive bullet with a .060 metplat. This bullet was originally made by "Hall of Fame" shooter Ed Watson. When Ed passed away we couldn't bare see such an incredible bullet go off the market. The list of National wins and records are too numerable to list. Easy to tune with match winning performance.